1 pound zucchini (about 4 small), remove ends but do not pare. Cut into 1/2- inch slices. In a large skillet, warm olive oil over medium heat. 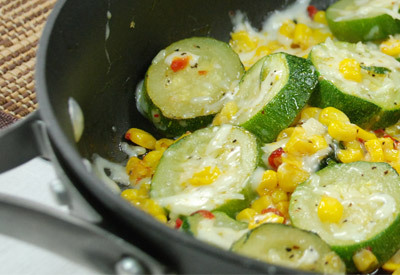 Add zucchini, corn, pimiento, salt and pepper and stir together. Cover; cook over medium heat, stirring occasionally, about 6 minutes. Stir in garlic and cook for 2 more minutes or until squash is crisp-tender. Stir in mozzarella cheese; heat through. Sprinkle with parmesan cheese and serve immediately.